With a cloud hanging over Israel Prime Minister, he could soon find himself facing calls to step aside. 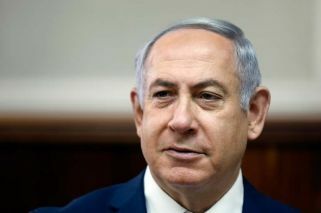 Netanyahu denies the charges and told the nation in a televised address that the recommendations would end in nothing. Israeli police have recommended that Benjamin Netanyahu be indicted in a pair of corruption cases, in an embarrassing blow to the embattled prime minister that is likely to fuel calls for him to step down. The recommendations marked a dramatic ending to a months-long investigation into allegations that Netanyahu accepted tens of thousands of dollars in lavish gifts from a Hollywood mogul and offered to give preferential treatment to a newspaper publisher in exchange for favourable coverage. Netanyahu has repeatedly denied wrongdoing. In one probe, called "File 1000," Netanyahu reportedly received over US$100,000 in gifts including champagne and expensive cigars from Hollywood mogul Arnon Milchan, Australian billionaire James Packer and other wealthy supporters. A prime minister who is facing such police recommendations or who has been formally charged with offences is not obliged to resign. In live TV address, minutes after the news was confirmed by police, Netanyahu said the police recommendations against him will "end with nothing," and said he was innocent. Netanyahu said his lengthy political career has been solely "for the good of the nation." He accused police of being on a witch hunt against him and vowed to remain in office. He wrapped up by vowing to stay in office and run for re-election.